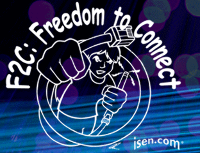 F2C: Freedom to Connect is a conference devoted to preserving and celebrating the essential properties of the Internet. The Internet is a success today because it is stupid, abundant and simple. In other words, its neutrality, its openness to rapidly developing technologies and its layered architecture are the reasons it has succeeded where others (e.g., ISDN, Interactive TV) failed.F2C: Freedom to Connect provides a platform for understanding the social utility of infrastructure, for innovation, for creativity, for expression, for little-d democracy. The Freedom to Connect is about an Internet that supports human freedoms and personal security. These values are dear to many of us whose consciousness has been shaped by the Internet, but they are often at odds with the values of mainstream media, Wall Street and governments around the world.F2C: Freedom to Connect is about having access to the Internet as infrastructure. Infratructures belong to — and enrich — the whole society in which they exist. They gain value — in a wide variety of ways, some of which are difficult to anticipate — when more members of society have access to them. The marginal costs of Internet connectivity are so low and the benefits so high that the free rider problem diminishes towards insignificance. F2C: Freedom to Connect especially honors those who build communications infrastructure for the Internet in their own communities, often overcoming resistance from incumbent cable and telephone companies to do so.The phrase "freedom to connect" is now official US foreign policy, thanks to Secretary of State Hillary Clinton’s Remarks on Internet Freedom in 2010. She said that Freedom to Connect is, “the idea that governments should not prevent people from connecting to the internet, to websites, or to each other. The freedom to connect is like the freedom of assembly, only in cyberspace.” Her speech presaged Internet-fueled assemblies from Alexandria, Egypt to Zuccotti Park. F2C: Freedom to Connect celebrates the freedom to connect and assemble everywhere, especially in the United States.The Freedom to Connect stands on three legs.The first leg is infrastructure, the rights of way, the poles and conduits, the wires and fibers and binder groups and cables, the electromagnetic spectrum, towers, antennas, receivers and transmitters, how they work, how their economics and business models work, and how the regulation of infrastructure promotes and impedes public telecommunications services.The second leg is the fundamental nature of the Internet, namely well-specified, well-understood public protocols, universally implemented with universal connectivity and open to all who meet its specifications.The third is the use of the Internet to promote bottom-up innovation and government of, by and for the people and to counteract anti-innovative vested interests and autocratic government power.